Click to enlarge image on Pinterest & repin. We’ve already established that Church Discipline must be exercised because of God’s Purposes for the church. And, a lack of church discipline goes against His purposes. 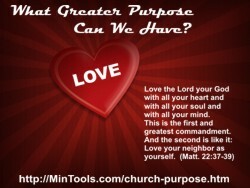 Our greatest purpose of loving God and loving others must also dictate the way we exercise church discipline. The process must be embedded in love. Our heart must be moved by love. Our attitudes must be governed by love. Our words must be guided by love “speaking the truth in love” (Eph. 4:15). We will look at the process for church discipline in a future post so consider subscribing to receive e-mail notice of new posts. Here we want to consider the attitudes and heart qualities that must be in us if we are going to exemplify God’s Purposes through the process of disciplining, if we are going to treat the person with love in each phase. Gentleness according to Galatians 6:1: When a person is “caught in a sin” we are to approach them gently, carrying their burdens as a way of fulfilling the law of Christ which is to love our neighbor. The objective is restoration of the person to a place of spiritual health and well-being so church discipline is not necessary. Humility according to Galatians 6:1-3: We are to not think of ourselves as better than this person. We too could easily fall into sin if we aren’t careful. Grieved according to 1 Corinthians 5:2: Deciding to exercise church discipline should be grievous. It should break our hearts to see a person so hardened by sin that they won’t repent after being warned and gently instructed. We should never take church discipline lightly. Humility according to 1 Corinthians 5: In this situation the church had chosen not to discipline people caught up in immorality. Paul pegged it as pride, the opposite of humility. The sin should have been grievous to them, breaking their hearts. They needed to yield themselves to God in this matter and do what was best for the people living in sin, not what looked good for them. Though this passage does not deal with a church that exercised discipline when they should have, it stands to reason that we would also need to guard against boasting about being quick to discipline. Forgiveness and Comfort according to 2 Corinthians 2:5-11: While a person might need to be disciplined to learn a lesson, the discipline does not need to continue after the lesson is learned “so that he will not be overwhelmed by excessive sorrow.” We must be careful that we do not break a person’s spirit in the process of disciplining. Forgiveness according to Matthew 5: After providing a process for dealing with brothers who sin against one another, Jesus and Peter got into a discussion about how often he should forgive a person who sins against him. Peter suggested seven times but Jesus replied, “seventy times seven.” Who is going to take the time to track that many offences? Affirming according to 2 Corinthians 2:7-8: When people are repentant we must make a concerted effort to reaffirm our love for them. Let’s learn from one another: Can you provide examples that contrast church discipline that exemplified God’s purposes versus times it did not? What lessons did you take away from those times? Please, help to throw some light in a case where a girl is found pregnant, and commits abortion? Describe the process of how such an one can be disciplined by the church. Again, if a brother’s child gives birth at home without a husband and he/she repents and continues in worship faithfully, can such a brother ever become one of the elders of the church? Does Proverb 22:6 mean that the child will never sin? Thank you for your contributory explanations. Hello, Moses Tabe. You have three different topics in your comment so I will respond in order.